Winter has always been the most romantic season. Maybe it’s the snowflakes, or the fireplaces, or how she looks in a sweater. Combine that with the holidays, and you have the perfect environment to make memories that’ll last the rest of your lives. So how will you make this December special? Whether you plan to spend the holidays curled up at home, on vacation somewhere special, or celebrating with your family or hers, there’s endless opportunity to propose. You’ve already made the biggest, most important decision—this is the person you want to spend the rest of your life with. Now let us help you with the rest. Below are a few winter proposal ideas sure to provide a beautiful memory, and the beginning of something unforgettable. 1. You. Her. A bottle of wine. A delicious meal. It doesn’t matter if you take her to her favorite restaurant or show off your culinary skills in the comfort of your home. The point is: this proposal is about you and her, and no one else. 2. Hide it in plain sight. Use a special holiday ornament on your tree or the Hanukkah candle box to hide the ring. Ask her for a kiss under the Mistletoe, and then say something to pique her interest about what’s inside that Reindeer ornament or inconspicuous box of candles. 3. Call in the carollers. Why? Because they’re charming and corny and undeniably cute. This is the one time of year where carolers are in season, so why not take advantage? Find yourself a merry crew, or enlist a group of friends to sing along as you get down on one knee. 4. Sock it to her. There’s nothing as classic as stockings hung over the fireplace. Make Santa proud and put the ring in her Christmas stocking. Then let tradition take care of the rest. Whether you’re in NYC’s Central Park, visiting her hometown, or someplace special to you both, a romantic carriage ride through the city is a reliably magical and memorable experience. Sound too cliché? There’s a reason for that. It works. 6. Write your proposal in the snow. Using rose petals, candles, or Christmas lights is a sweet and memorable way to ask for someone’s hand. Added bonus that it’s completely Instagram-worthy too. 7. Make it part of your other holiday activities. Bring it back to basics and get down on one knee while you’re decorating the Christmas tree together. Or on Christmas morning, before you open your gifts. We guarantee this’ll keep the two of you cozy and joyful at home all day long. Here’s one all the women at Ritani agree on. Bring her a glass of champagne with the ring tied to it with a silk ribbon. It’s simple, elegant, and keeps the focus on her. 9. Show your love with latte art. Heads-up, aspiring baristas and hot chocolate fans. This one will get your lady’s heart pumping (and not just from the caffeine). Write your message on her favorite beverage with a coffee stencil. If you’ve already talked about the ring, chances are she has thoughts on what it should look like. When you’re ready, take her holiday shopping and let her pick out the ring of her dreams. You know her well enough to know if she likes surprises. If she does, this one’s for you. All of you. Invite your friends and family and plan a surprise proposal party. Like they say, the more the merrier. 12. Get your girl with a getaway. Take a trip and propose while abroad. You’ll always have the place where you met, and the place where you live. Make the place where you get engaged somewhere spectacular. Ring in the new year with a ring! Wait for the New Year’s Eve countdown. When the ball drops, get down on one knee and start your year with a Yes. 14. Take it to the studio. A Christmas photo shoot proposal will capture her joyful surprise, and leave you with a truly exceptional photo that documents the start of your new life together. 15. Make it picture perfect. Go to one of your favorite places, somewhere that has personal significance to you both. Once you’re there, ask someone to take a picture of you. When they do, drop down on one knee. 16. 30 Rock her world. If you’re confident on your feet, consider proposing at an ice skating rink like the one at New York’s Rockefeller Center. This sentimental public gesture won’t leave a dry eye in the house. 17. Put your love in the air. 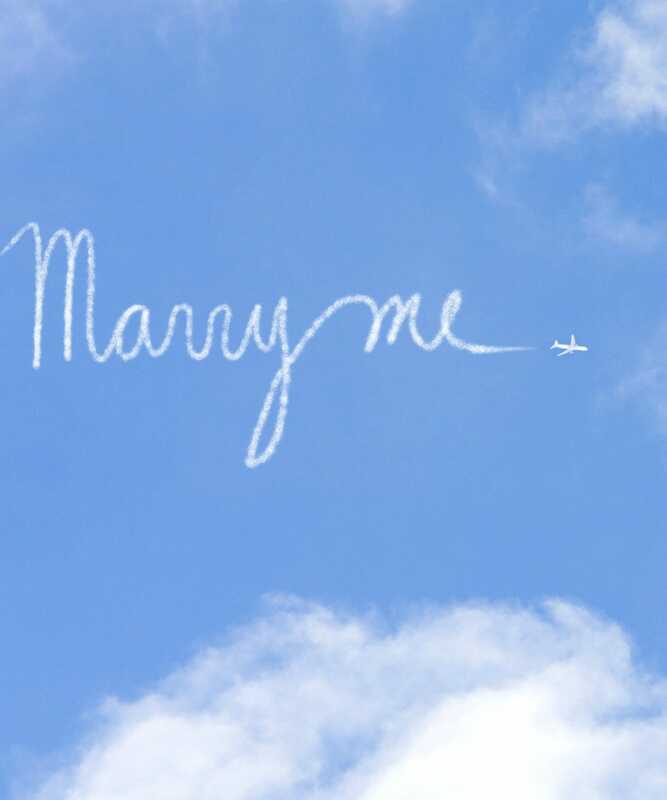 Pick a clear day, and hire a skywriter to spell out your proposal overhead. Find more proposal inspiration on Pinterest! Meet Oscar, Ritani's diamond expert. Whether you're looking for jewelry inspiration or diamond education, he's here to help. Emerald Cut Diamonds vs. Radiant Cut Diamonds: What’s the Difference? © 2009-2018 Ritani, LLC. All Rights Reserved.